Watching and reading the news can become a habitual activity when you’re an investor, especially when there’s trading news that is applicable to your investments. And if the news about your stocks happens to be positive, you may feel elated and breathe a little sigh of relief. On the other hand, if the news is bad, you may feel this bugging notion to sell the declining stock or redistribute the assets. Responding to stock performance through news outlets isn’t exactly ill-advised, however, it could turn out to be if you’re letting the news take over your previous rational method of thinking when you chose those stocks in the first place. Every so often a financial trend emerges and clients get enticed, allured, and (perhaps) even reckless. For example, cryptocurrency has been a reoccurring news story for the past few years. Bitcoin might be the trendiest example in recent memory. In the winter of 2017 a single Bitcoin was worth nearly $20,000, however, less than a year later the value of one was only a fraction of that. Bitcoin proves a cautionary tale. As with any risky investment, a substantial amount of money could have been made or lost in Bitcoin. What happens when your clients are eager to start exploring an investment like Bitcoin? A wealth manager who understands behavioral finance techniques may consider employing the core-satellite approach to let the investor have some fun exploring a novel investment in the "satellite"; all while still protecting the bulk of their assets in the "core." Investing just a small portion into cryptocurrency would allow clients to experiment with investment strategies and avoid huge risks to the larger investment. The core-satellite approach can be an effective way to manage the emotional responses of a client, while also giving them the freedom to make financial decisions without risking mass repercussions. Within the satellite allocation of the portfolio, an advisor can allocate a small amount, say 5 percent, to investments that the client is excited about as a way of limiting their potential losses from sentiment while also allowing the client to become more emotionally attached to the portfolio. If the client wants to invest in gold → let them take a small position. If the client has a favorite stock → you can encourage them to buy a few hundred shares. As long as your client stays under the allocated amount, sentimental investments will not hurt the portfolio and might provide some behavioral benefits for the client. The core-satellite approach can be a useful way for an advisor to allow a client to break the investment portfolio into sections. This investment method is also known as bucketing. By placing assets in different accounts, or buckets, an advisor can help reframe how an investor views risk. Each bucket doesn't need to actually be in a different physical account, but by viewing them differently, they're placed in different mental accounts. In the case of the core-satellite approach, each section of the portfolio is reframed in order to better manage a client's natural behavioral biases. 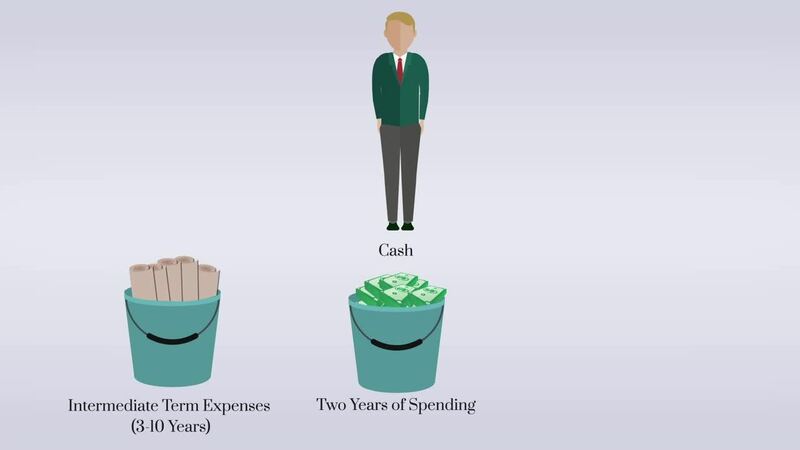 An advisor may wish to create a “cash” bucket that's the equivalent of two years of spending. Another bucket may be set up for intermediate-term expenses, say three to nine years in the future, and contains a slightly riskier mix of assets. A third bucket may be set up for long-term expenses over 11 years and consists of mainly high-risk assets. Over time, assets from the different buckets can be liquidated in order to refill the cash bucket. A common bucketing strategy is to replenish the cash bucket from income earned from bond investments in the intermediate-term bucket or from dividends or strategic asset sales in the long-term bucket. Using this approach can help a client tolerate volatility in the high-risk bucket because they know it won't be touched for more than 10 years. It can also provide clients with a sense of security because they know that even if market values decline, they still have two years' worth of grocery money sitting in the cash bucket. This approach can be a particularly useful framework to help clients shift their focus away from losses in the risky portion of their portfolio. The bucket strategy meaningfully links investments within the portfolio to goals in the near term, intermediate term, and long term. Bucketing should be viewed primarily as a behavioral technique since bucketing assets doesn't actually change the overall portfolio allocation. Ultimately, the goal of a wealth manager should be to maximize the after-tax return on an investment portfolio whose allocation is properly aligned with its owner's risk tolerance and time horizon. However, bucketing can, in fact, help a client achieve higher returns by encouraging them to maintain a suitable asset allocation over time. Clients seek advisors with a true understanding of their unique needs and goals, and in response to that, a team of investment researchers created the award-winning Wealth Management Certified Professional® (WMCP®) designation. Advisors with the WMCP® have deep knowledge of personal wealth and investment management, including portfolio theory, behavioral finance, mastery of investment tools, and advanced wealth management strategies.